If you want to know about finances in SLO County, James P. Erb, CPA, is definitely your man. Ever since two main county financial offices (the treasurer-tax collector’s office and the auditor-controller’s office) merged on Aug. 12 of this year, Erb, 61, has helmed the combined office of the county auditor, controller, treasurer, tax collector, and public administrator. The office employs 66 people, and takes up almost the entire second floor of the County Government Center. In an extended conversation with New Times, Erb explained the merger and demystified the sometimes foggy public perception of his office. TAX MAN, AXE MAN: Though James P. Erb—the county’s auditor, controller, treasurer, tax collector, and public administrator—may deal with weighty financial issue at his day job, he’s also a Led Zeppelin enthusiast who enjoys playing the guitar when he can find the time. New Times: Do you have the longest job title in the county? NT: How did you get to where you are now, from the beginning? Erb: Well, it’s kind of a different story. I grew up in Santa Barbara, and I actually worked as a paramedic for many years at the Santa Barbara County Jail and in Austin, Texas. That whole time, I was doing income taxes on the side, because I loved math. I would do short forms for $4, and long forms for $10. Eventually, I decided to pursue accounting. I moved to SLO and went to Cal Poly. I graduated in 1987, and I have been working for SLO County in the auditor’s office since 1990, working my way up the ladder; 23 years, if you can believe it. NT: When you were a jail medic, if someone had told you that you were going to be a CPA and in charge of SLO County’s financial apparatus, would you have believed that person? Erb: Absolutely not. I wouldn’t have thought that was the direction my life was going. Opportunities opened up, though, and I was there to step in. A couple of times, I’ve stepped into things that were kind of over my head, but I’ve managed to rise to the occasion each time. I learned as I went along, but there were definitely a lot of sleepless nights. NT: OK, we’d like you to break down your five job titles. Could you use one sentence, roughly, for each title, and tell us what each part of your job consists of? Erb: The auditor is our internal audit division; that’s where we’re looking at county operations. The controller is money that’s being paid out; we’re making sure that that money’s going to the right people, that the amounts are correct, and that it’s for the intended use. The treasurer, we’ve got the money that we’re investing, we’ve got schools and special districts—over a half billion dollars that we invest—and our goals are liquidity, safety, and earnings. The tax collector is our property tax collector, and we send bills out, track delinquent payments, and make sure that everybody gets their taxes paid on time. The public administrator handles estates where there’s nobody willing or available to take care of the estate. NT: Tell us about the Aug. 12 merger. How did it come about, and what have been some of the main benefits? Erb: Well, it started being discussed a few years ago, and we went forward with it after a lot of discussion. There are definitely some dollar savings and some efficiencies that we’re able to get from this. This year, we’re projecting savings of about $280,000, and then into the future, we think our savings will be about $323,000 per year. We used to have citizens going back and forth between the two departments. This merger makes it so we’re a “one stop shop” where people can get all their answers. NT: Is there precedent for this kind of merger? Erb: About 11 California counties have done it thus far. The state has said, essentially, that it can go either way. It depends on the circumstances. NT: What are some of the main arguments against merging county financial offices? Erb: Probably the main one is managing internal control issues—you know, the liability of people collecting money and then making payments in the same office. The other one is that it’s just too much, for one person, to be in charge of the merged office. We control security very effectively in our office, though, and I feel like I’m doing my job effectively as well. NT: What do you think the average SLO County resident thinks goes on in your office? Any major misconceptions? Erb: I don’t think we’re really thought about that much. We’re often mixed up with other entities. There are definitely some misconceptions—we have some people who look at audits like an investigation. We get things from people at public comment like, “You should audit the Los Osos sewer.” That’s just not what an audit is. We can’t audit broad things like the Los Osos sewer; we’d just be spinning our wheels. We’re not the district attorney. NT: How fiscally responsible do you think SLO County is, compared to other counties out there? Erb: We’re not perfect, but we’ve done well. A lot of other counties are furloughing people or closing on certain days because they don’t have the money, and we haven’t had to do that. We feel like the buck stops here—we’re the top accountants in the county, and we have to provide the answers. There’s nobody else to call after us. NT: How much longer do you think you want to keep doing this? Erb: I want to run for another term once my term expires in 2014, and it’s a four-year term. The assistant auditor is extremely competent, and he’ll be a great person to step in when I’m done. 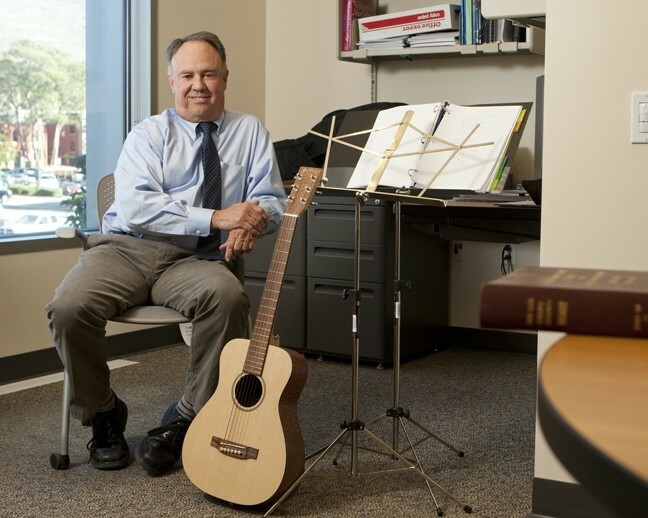 NT: We’ve got to know: What’s with the guitars, music, and music stand in your office? Erb: Ever since I was 12 years old, I’ve loved playing guitar. I’ve never practiced enough to get really good at it, but just enough to have fun. I like Led Zeppelin, The Doors, Creedence Clearwater Revival—all kinds of rock’n’roll. NT: What is the most important thing that your office does that you’d like SLO County residents to know about? Erb: We are the guardians of the funds that are kept in the county. A lot of people depend on us. We are very serious about protecting that money. We are an independent source of information, and we are not associated with any political party. Our information is accurate, dependable, and the same for everyone.